Couples planning a backyard wedding may search for helpful ideas to transform this space into a magical nuptial haven. You can make a checklist of different creative ideas to compare with the realities of hosting your wedding in a backyard. Various wedding tips can help you decide if such a venue is the best option for your wedding theme and number of guests. While some couples may think a backyard is too casual to serve as an appropriate wedding location, a nice backyard can actually be a unique and charming setting for the wedding ceremony, reception, or both. For some couples, it is sentimental to marry in the backyard where they may have played games as children or shared their first kiss as a young couple. Backyard weddings can be much less expensive and less stressful than celebrations at different locations, and the familiar setting of a backyard can be comforting during the anxiety of this major life change. For some couples, a backyard wedding may be a more practical option for their special day. If their parents are unable to travel for medical or financial reasons, a backyard wedding will ensure they can be a part of the festivities from start to finish. If the couple has recently purchased a new home, a wedding in their new backyard can serve as a housewarming and a wonderful way to begin their lives together. Size: The yard should comfortably accommodate the guests for the entire event, if desired, including dining, dancing, and the ceremony. A small backyard cannot handle an extensive guest list. Weather: If a yard gets incredibly muddy after even a small shower, it may not be suitable for an outdoor wedding when the weather may be unpredictable. Terrain: Flat, spacious yards are best for parties. 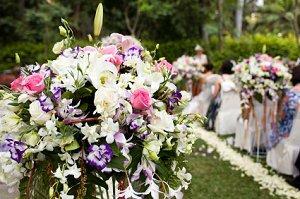 If the yard is uneven, steeply sloped, or filled with obstacles, it is less suitable for a wedding. Facilities: Not only does the yard need to be suitable for the celebration, but guests will need to use the restrooms as well. At least two rooms should be available for the bridal party's preparations (one for the men, one for the women), and the home should have sufficient nearby parking for all guests. Pets: Not only should the home's pets be well behaved for the wedding, but if a neighborhood dog barks incessantly when strangers are nearby, it may not be wise to hold the wedding in the backyard without arranging for the animal's care. Neighbors: Most neighbors will be understanding about an at home wedding, but it is best to speak with them before making firm plans to be sure they are okay with the backyard wedding ideas. Consulting with the neighbors will also ensure that no exterior renovations or construction is ongoing during the wedding. Arrange proper lawn care, particularly fertilization and weed control, to keep the grass healthy. Consider planting annual flowers in beds, window boxes, urns, or other planters to match the wedding colors. Keep hedges, trees, and flower beds meticulously pruned and weeded. Repair and clean fences, patios, decks, and other backyard features. Clean the exterior of the house if necessary. Trim all hedges and trees a few days prior to the wedding. Mow the lawn a day or two before the wedding, including edging around sidewalks and flower beds. Consider mowing the aisle area even shorter to help distinguish it from the rest of the lawn. Rent a tent, multiple umbrellas, or canopies to provide adequate shade. Separate the ceremony and reception areas with a decorated fence, ribbons, or other markers. Utilize all available space, including porches and decks, to create a more elegant and less confined event. For a small yard, reuse the ceremony seating for the reception. The reception can be formal or casual dining. Barbeques, picnics, and wedding finger food receptions are popular for backyard weddings. Properly planned, prepared, and decorated, a backyard wedding can be a beautiful and meaningful event. There are many backyard wedding ideas couples can choose from, and being aware of the various options for an at home, outdoor wedding will help them create their dream wedding right in their own backyard..